A morning shooting in Las Vegas left five people—including two police officers and both shooters—dead, officials say. NBC News reports that Las Vegas Metro Police Department officers Igor Soldo, 32, and Alyn Beck, 42, were having lunch at Cici's Pizza around 11:20 a.m. when a man and a woman entered and began shooting. NBC News adds that a witness said one of the gunmen yelled "This is the start of a revolution" prior to opening fire. Sheriff Doug Gillespie said that one of the officers was able to return fire before dying. 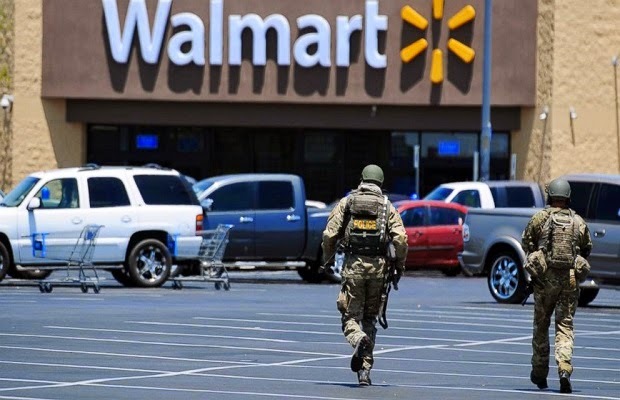 After taking the officers' weapons and ammunition, the suspects traveled across the street to a Walmart, where police say they fatally shot a third victim. The male shooter reportedly yelled for everyone to leave the store prior to firing a series of warning shots. According to NBC News, police engaged in a brief shootout with the two suspects before they retreated to the back of the store and reportedly took their own lives. Neither of the shooters have been identified, and though no motive has been established yet, the investigation continues.